DVDFab Mac Blu-ray Player boats its all-in-one media playback solutions including BD, DVD disc, movie folder, ISO file, and other video formats. And it’s a complete free tool if you’re satisfied with using it to play DVD or Blu-ray movie folders on your Mac. If you happen to have an army of movie folders saved for enjoying later, then you’ll want to have a look at the following tutorial about how to use Mac Blu-ray Player to play movie folders, to get an idea about this free movie folder player for Mac. 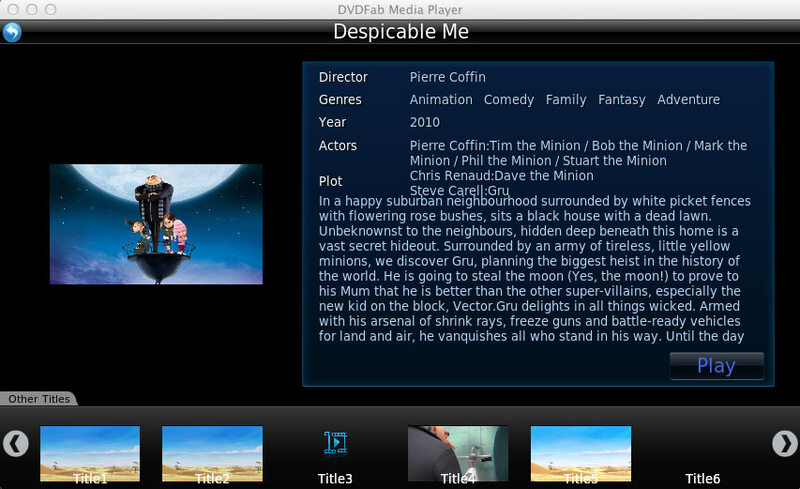 It’s really easy and simple to download and install DVDFab Mac Blu-ray Player. As soon as the installation has completed, you’ll see a corresponding shortcut on the desktop, double click it to start it up. On the main interface of the player, you can see an “Open File” option, which is for you to use to get your ISO file, movie folder or other video file loaded in. So just click it to navigate to the location of your movie folder. And click on the folder to start loading process. Seconds later, the loading process will be completed. If it’s a DVD folder then you can directly go to navigate on this DVD to play. If it’s a Blu-ray, you need to choose a play mode for it. One is “Quick & Simple Mode”, the other is “Full Navigation Mode”. In “Quick & Simple Mode”, you can choose to play main movie title by clicking “Play” button, or select other title to play, by the way, some basic movie info is showed at the interface of this mode, like Director, Genres, Year, Actors, Plot, etc. In “Full Navigation Mode”, you can get full Blu-ray navigation feature and complete control experience, and DVDFab Mac Blu-ray Player is the first player software in the world to provide this feature for Blu-ray playback on Mac. During the movie playback, you can freely control the play to Pause, Stop, Volume up/down, Fast forward/backward, etc. by hovering mouse on the bottom of the screen to bring about a control bar. Another control bar will pop up when hovering mouse on the top. And you can set the play screen to full screen, and set audio or subtitles at there. If you want to do more operations, just right click on the screen to bring about a settings panel where you can open another file, open another disc, control the play, set audio and subtitles, etc.